This charming Child’s Log Cabin playhouse offers a perfect cottage style building for your child to relax or play in and is sure to enhance play times outside! 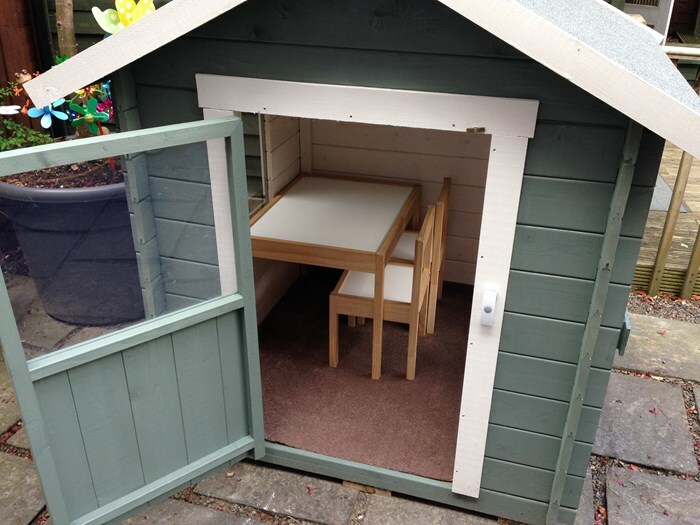 At the heart of this fantastic playhouse is second to none craftsmanship, highlighted by the use of a solid 19mm tongue and groove construction, which maximises the structural integrity of the build. Whimsical features such as the cottage style windows and door, complete with shutters and flower boxes, make this playhouse a fun and exciting place for any child to spend time in! The Child’s Log Cabin has been designed in a single storey cottage style that will make your child feel like they’ve been transported to one of the cottages in their favourite fairytale stories! The cottage style door with a built in window, gives a real country look, perfect for dreaming up their own fairytale world to play in. 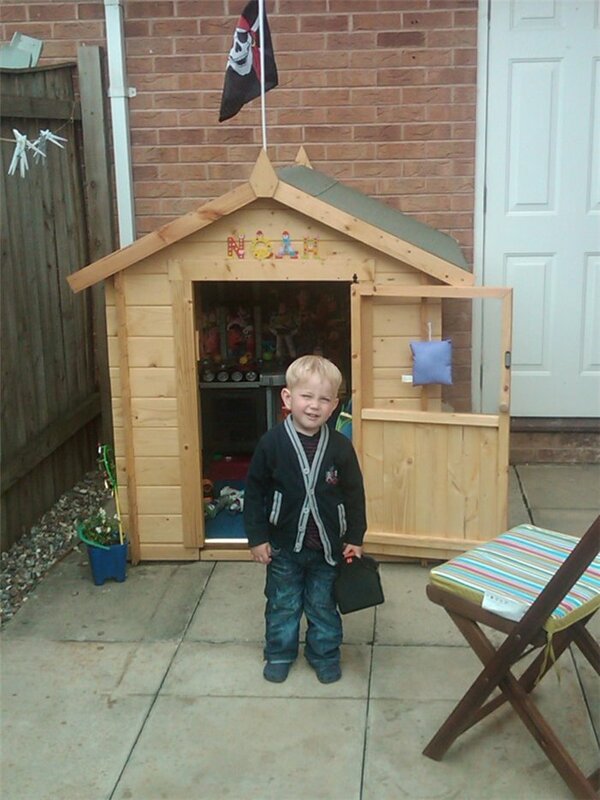 This single storey playhouse is built using high-quality materials and will provide hours of fun, making it a truly worthwhile investment for your garden for years to come. The two cottage style windows come with authentic shutters and flower boxes. This enhances the the look of the exterior to the playhouse, as well as providing charming features your children will love. Two windows creates a light and airy space for your child to play. The Child’s Log Cabin includes with two sets of shutters and two window boxes which all add charm and character to the build. The flower boxes look great planted up with flowers and your children will have fun watering them! 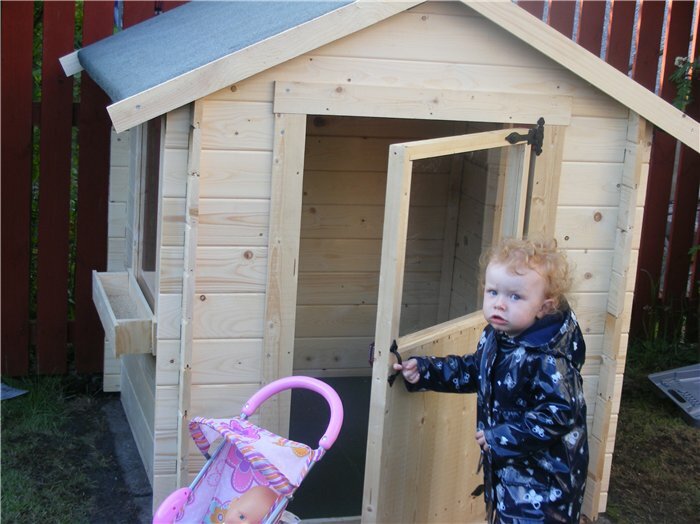 The Child’s Log Cabin is constructed using our incredibly popular tongue and groove construction. This design gives the unit it’s great strength, as well as providing a rustic, all-round smooth finish. The panels are all pre-cut to length and the interlocking style of this construction makes each board hold the previous board securely in place. As the panels interlock together, they give the Child’s Log Cabin great protection against the elements. With no water entry, rain can run off the side of the building, which ultimately stops the joints being damaged and prevents long term rot issues. A solid sheet floor is included with the Child’s Log Cabin Playhouse.This is pre-cut to size and is simply attached onto the floor joists, so all you need to do is lay it on the ground and build your way upwards. The solid sheet floor is able to handle all domestic use and is a solid base for handling lighter items such as your children’s toys. You don’t have to worry about what roof you’ll get because we already supply the solid sheet for you. It’s pre-cut to size and ready to assemble for a simple and easy installation. The solid sheet roof also comes with a green mineral felt which is considered as a premium roofing felt and gives the building substantial protection from the elements. Eaves Height (Inc Floor) 112.1cm 3'8"
Ridge Height (Inc Floor) 139.1cm 4'7"
Eaves Height (Internal) 106.1cm 3'6"
Ridge Height (Internal) 130.6cm 4'3"
Window Dimensions 41.8cm x 54cm 1'4" x 1'9"
Door Opening Size (w x h) 54cm x 95cm 1'9" x 3'1"